Pegasus is one of the most famous mythical characters. Appearing in ancient Greece, the image of this character has spread throughout the world. We could meet a pegasus in a variety of books, movies and games. So, let’s start the lesson and learn how to draw a pegasus. 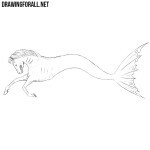 Despite the fact that this is a mythical horse, in general it is drawn as an ordinary horse. Let’s start with the skeleton of our pegasus. First of all sketch out the head in the form of a circle. After that sketch out the muzzle and the neck line. Next draw the outlines of the chest and pelvis. At the end of the step we sketch out the legs. Now we need to add some volume to the body of our pegasus. First of all draw ears and line of eyes on the head. Further draw the neck which extends to the thorax. Next, connect the thorax and pelvis, forming a torso. Sketch out the legs, trying to repeat all the curves as in our example. At the end of the step sketch out the wings and tail. Now let’s work with the final details. Using clear and dark lines draw out the outlines of the head. Next carefully draw the eyes, nose and mouth. Do not forget to erase guidelines from the head of our pegasus. Also, do not forget to add a couple of creases to the head to make it more realistic. 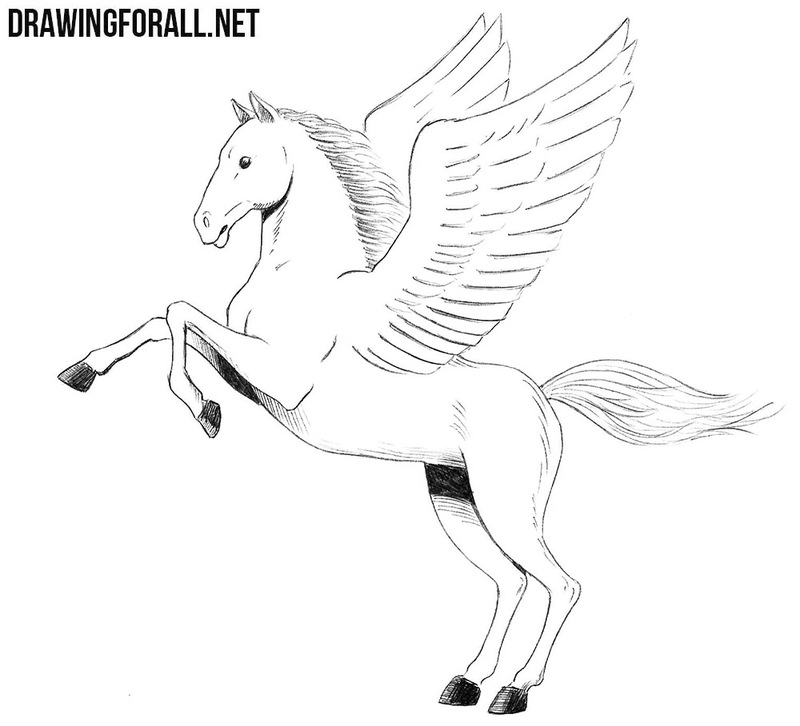 Continue the lesson about how to draw a pegasus. In this step we finish drawing the head. 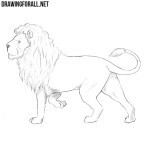 Draw out the ears and with the help of wavy lines draw out the mane. 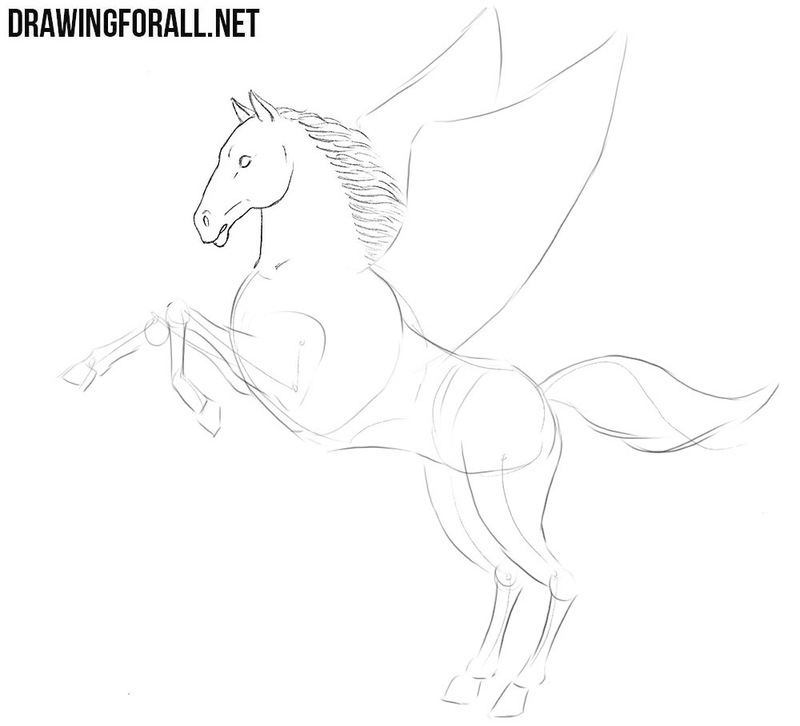 We drew a rather short mane, but for greater epic you can draw a long or fiery mane. 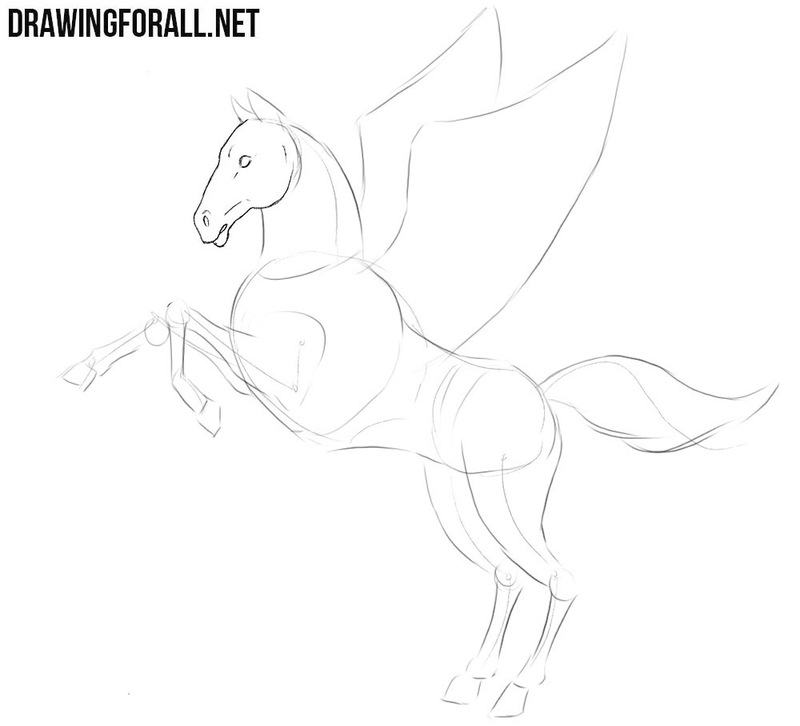 Now let’s draw out the wings. Draw several rows of feathers. Note that feathers that are closer to the edge of the wing are larger than the rest. In the same step, using the clear and dark lines draw out the front legs and remove all unnecessary lines from the legs and wings. 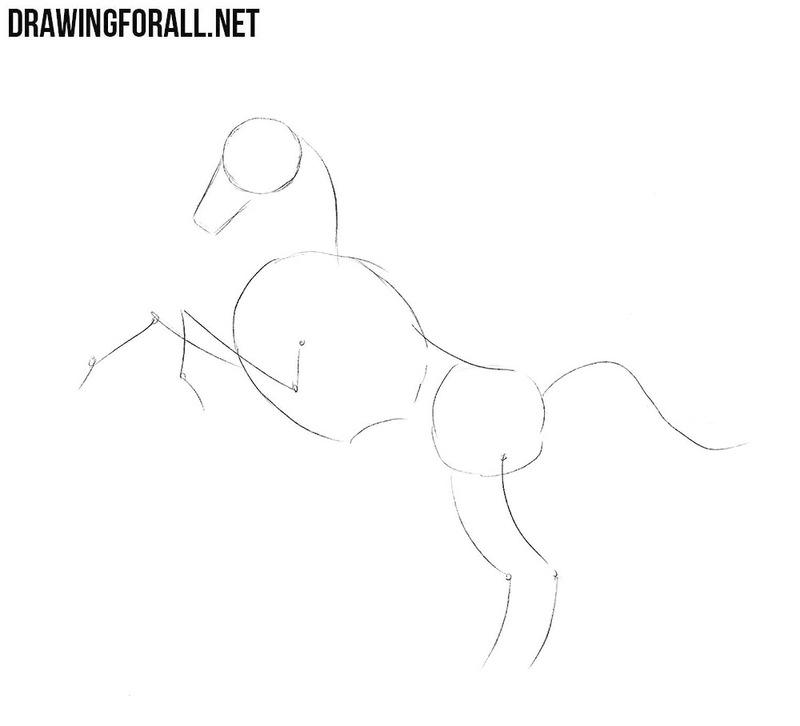 Now we need to do the same, but with the back of our horse’s body, that is, using clear and dark lines, we will need to draw out the hind legs and tail. 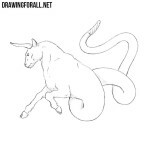 To make the tail more realistic, use long and slightly curved lines. 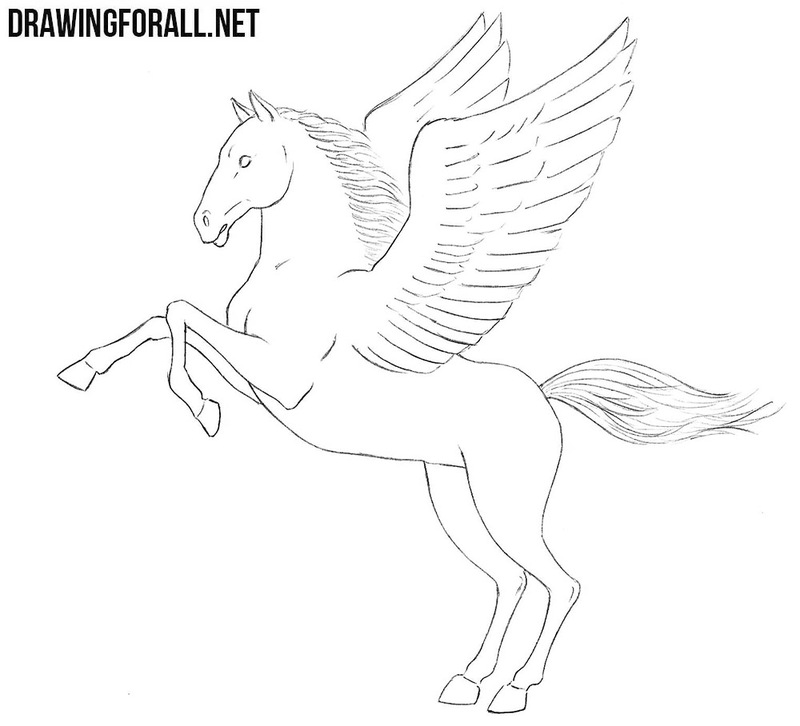 Do not forget to erase all unnecessary guidelines from our pegasus drawing, so that the finished drawing is clean and nice. To make our Pegasus look more real, we need to add some shadows. We drew shadows, similar to the shadows from comics. That is, it is dark and contrasting areas of shadows. But you can make more light shadows, as in the lesson about dire wolf. What other mythical characters would you like to see on the pages of our site? Do not forget to write your suggestions in the comments to this article. Also, do not forget to subscribe to us on social networks and share our lessons. Also we want to remind you that not so long ago we created a page on Patreon. 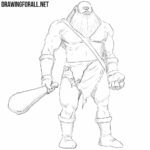 If our site is interesting for you, and you want to see more new and interesting drawing lessons, consider about supporting us on Patreon. Thank you for attention.